We have visited Elephant Sands about 5 times in the last two years and have enjoyed our visit every time. Elephants, Elephants and more elephants. It is amazing to see so many, and of all sizes, up close and to see how they interact with each other. Seeing a pack of wild dogs coming to drink and on another occasion they chased a kudu almost into our camp site. Elephant Sands is situated about 50km north of Nata on the Kasane road. The lodge is expanding and now has 10 new Safari Tents, which are very spacious, comfortable and en-suite. They also have quaint en-suite cottages and chalets. Camping is available with shared ablutions. There is no electricity at the campsites but one can charge phones, camera batteries and the likes at the lodge. The main building has a restaurant, bar, deck over looking the water hole and a swimming pool (which is occasionally emptied by the elephants). 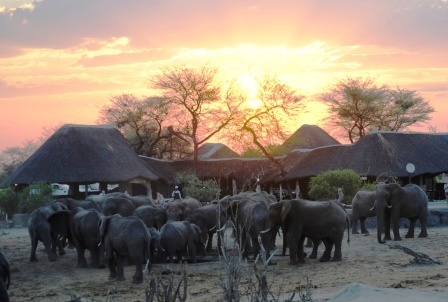 The lodge is open all year round, but if you want to see lots of elephants the dry season is best (July – October). Most people use Elephant Sands as an overnight stop over, but we like going for a few days. As most people arrive late afternoon and leave early morning the days are quiet and it is lovely to relax on the deck with a book and a cocktail. The new tents, chalets and cottages are very nice, but I feel the best way to experience Elephant Sands is to camp. Elephants pass right through the camping area and they pass you within a few meters. Like the slideshows. Can videos go up so we can hear the sounds too?